Landscape of pastel houses at an abandoned worksite on Lower Matecumbe Key, Islamorada, Florida. 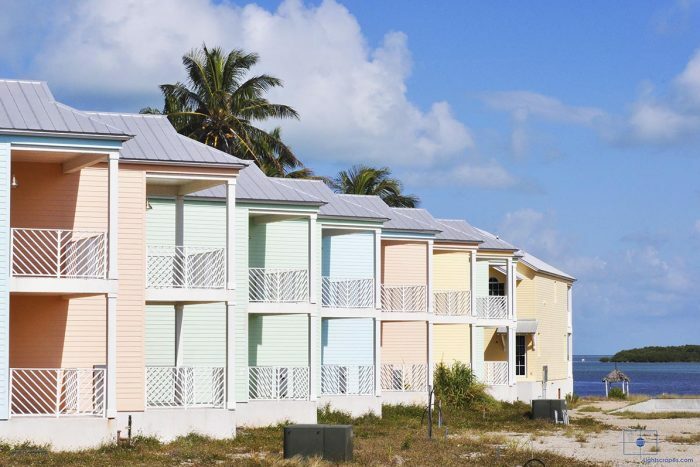 Contrasting with the natural color palette of the Florida Keys, the pastel greens, pinks, yellow, and blues of the structures form a chromatic contrast. As the colors of the houses, illuminated by the pure Florida morning sunlight, are inherently calm causing the divergent effect to feel restrained. Pristine in their newness and regularity, the buildings are out of place in the luxuriant chaos of the natural environment and uncompleted construction site.